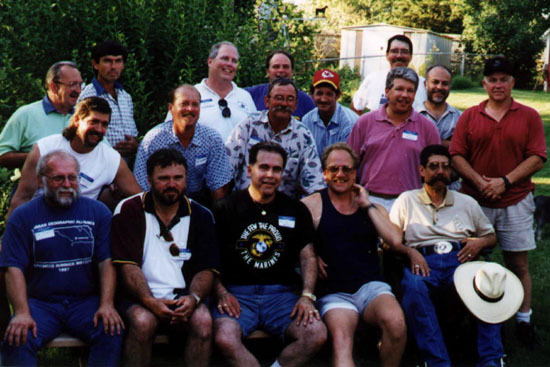 This photo shows the former CAP 2-7-2 Marines and Navy corpsmen who attended the CAP 2-7-2 reunion, June 26-28, 1998, in Kansas City. (Middle row, L-R) John “Crazy” Sigouin; Mike Harper; Ken “Dunc” Duncan; Rick “Doc” Doggett; Jim Wallace. (Back row, L-R) Scottie Shirley; Glenn Trimble; Roch Thornton; Nelson Kilmister; Dennis “Huck” Prock; Willie Fulfer; Luis “Marty” Martinez.